Looking at the company strategy, whether it’s a small company or a large one, there are a “few” things that needs to be looked at. Who decides to do what? Economist Right time to be investing in expansion? For the strategist, it’s necessary to combine all these different business disciplines in to one and you need high-level evaluation skills in order to be able to choose among the sometimes many competing courses of action. It’s good to understand, that employees acts out of their own interest mainly. This is referred to as the principal agent problem. Basically the company needs to have some kind of contract in place with employees in order to align their interests. It could be a bonus, responsibilities, motivation etc. With the strategist understanding the above, clear objectives needs to be set. A long-term view of what the company is about and the markets within it should be operating. It’s called a vision since it’s usually not expressed in detailed terms. The vision above needs to be translated in to a tangible set of directions which can be used by employees to direct their efforts in a manner which is consistent throughout the organisation. It basically means making sure it contains clear goals, that can be understood in the organisation. Now it’s time to look into a whole range of models in order to be able to attempt to create a “what-if”-scenario. It’s not trying to predict the future, which is impossible – but to try to see what is likely to happen. 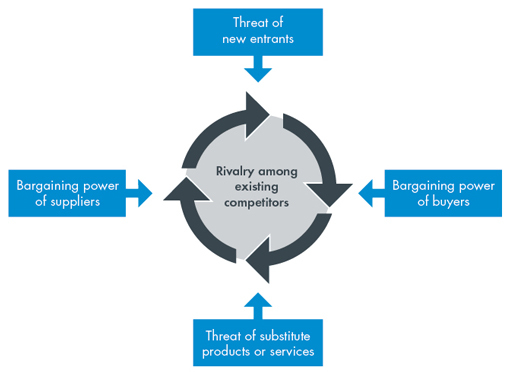 Porters 5 forces: A way of visualizing an industry. Analyse internal factors such as competence, ratios (Accounting), marginal analysis (an economic concept), cash flow analysis (see my Business case NPV post). SWOT Analysis (Strengths, Weaknesses, Opportunities and Threats). Look at generic strategy alternatives, strategy variations and strategy choice. What are the options? Stay stable, expand or retrenchment? Would differentiation of the products (try to be unique) be an option? Price leadership – would leading by positioning as a price leader support the strategy?A full analysis including Risk analysis, scenario models and again the NPV Cash flow business case calculation could help to make the best choice. Company structure and resource allocation (i.e who’ working on what) should be aligned with the strategy. The correct resources should be allocated accordingly. Motivation of people, what managerial style is used, how the company structure is setup (i.e. divisional, functional, matrix etc) make a big difference. Project management, in all kinds, can be the difference between being able to reach the strategy objectives or not. It should be made sure that all areas have access to the same information. Companies that are able to act on the feedback they get in this continuous loop/iteration are calling themselves “Learning organisation”. Is the company ready to act on new information, changes in the competitive environment and is the structure in place to do this rapidly? As key indicators shows one form of reality, changes should happen quickly. Failure to adapt to the reality will lead to loss. This post was written in order to give a short introduction to Strategic Planning. This large area combines all the other areas into one and makes sure that the best course is chosen following a process (open). The opposite to follow a plan would be to react to things as they happen (a reactor). It’s impossible to predict the future with any degree of certainty however all attempts must be made in making sense of the available information that is out there, and use proven models. If this is not attempted, then everything is left to chance, and it also may be that good opportunities are lost.